Hi I'm Mike with Craft Supplies USA and today, we're gonna turn an Artisan Stainless Steel Bottle Stopper. Here at Craft Supplies USA, we offer a wide selection of Bottle Stopper Kits. and they all turn very easily. Most of these bottle stoppers are turned using just a drill chuck and bottle stopper mandrel and that's what we'll be using today. Before we start, I'd like to address a few save practices about bottle stopper use and wine storage. 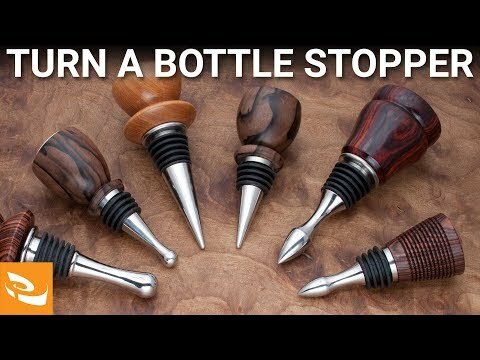 Bottle stoppers are used for display purposes only and are not meant to store wine. Once your bottle's open, plan on drinking it, because most wine will go bad within a few days. And when you use your bottle stoppers, it's always a good idea to stand them upright for two reasons. Number one.Even though bottle stoppers have a silicone seal to prevent leakage, not all bottle necks are created equal. store the bottle upright if possible. Reason number two. Wine will corrode the plated stoppers surprisingly fast, so it's a good idea to store those ones upright. However, we do offer a stainless steel version that won't corrode. and a blank that's about 1-1/2" x 1-1/2" x 2" in size. On this project blank selection is important. because it'll be great for threading. Now let's head over to the lathe and have some fun! and setting the lathe speed to about 2,500 RPM. then create a dimple to help the drill bit center itself. Now that the blank is prepped, let's talk about selecting the right drill bit. If you're using a hardwood or an acrylic, pick an 11/32". If your woods a little bit softer, use a 9/32". Measure the length of the bottle stopper mandrel stud and add an eighth of an inch, then mark the depth with some tape. Now slowly advance the bit until you reach the tape mark. Now let's tap the thread. I find it easiest to leave the blank in the chuck for this process. Use a wrench, or tap handle and advance the tap one turn, then back out a quarter turn to relieve the chips. This technique is slow and steady process, but you'll produce the best results. Just keep going until the tap bottoms out. If you'd like more detailed instruction on threading and tapping, check out our other video, "Threading Wood and Acrylics". Now mount the bottle stopper mandrel and bushing in the drill chuck on the headstock. Thread the blank onto the mandrel. Remember, the threads are delicate, so don't over-tighten it. Now advance the tailstock with a sixty degree cone center for added support. and turn the blank to round using a spindle gouge. that could damage your threads. Now turn the bottle stopper to your desired shape. I really like traditional shapes, but this is all up to you. precise here like pen kits require. Once you've got your desired shape, remove the tailstock and lightly turn the top of the stopper to its final shape. Make sure to take light cuts here, because a bad catch could damage the threads. I'll sand the blank through 600 grit with the lathe speed around 750 RPM. This will help avoid heat damage from the sandpaper. it's easy to apply and can handle a lot of use. then unthread the stopper just a hair, so we can finish the bottom too. Now apply a coat of Waterlox with a clean rag. Wipe away any excess and allow one hour to dry. and make sure to give this coat 24 hours to fully cure. Once fully cured, use synthetic steel wool with some fine paste wax for a smooth, close-to-the-grain finish. Now wipe the stopper dry with a clean cloth. Carefully unthread the stopper and we'll finish it up at the table. for a little more secure fit. It's not necessary, but I like my projects to last. and slowly thread on the stainless steel bottle stopper. Once the glue is fully cured, your bottle stopper is complete. Now that it's finished, this bottle stopper is ready to use. If you liked the video, give it a thumbs up and subscribe to our Channel. Also, be sure to check out www.woodturnerscatalog.com for the largest selection of woodturning supplies in the industry.